Join Ben in this month’s episode of Fieldnotes as he explores the wide array of defensive strategies displayed by the “Emperor of the Forest”, the Eastern Indigo Snake. 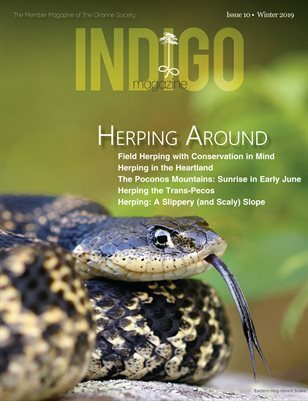 In this month’s installment of Fieldnotes, we’ve kicked off the 2018-19 Eastern Indigo Snake survey season, and Ben takes a moment to discuss the seasonal behavior of Georgia indigos, while showcasing Humboldt, a large male from our mark-recapture study. The early fall months are prime time for observing Georgia’s sandhill snake species. Join Ben in this episode of Fieldnotes as he shares a recent encounter with one of the Southeast’s most elusive upland snakes, the Southern Hognose Snake (Heterodon simus). During this special vacation edition of Fieldnotes, Ben joins his brother Nathan, TOS member, Ian Garrison, and US Forest Service biologist, John Rohrer for some rattlesnake telemetry and Washington field herping. Join Ben Stegenga and Jonathon Bolton as they kick off our trap survey efforts for Suwannee Alligator Snapping Turtles (Macrochelys suwanniensis) in previously unsurveyed sections of South Georgia rivers. A huge thank you to TOS member Tucker Ennis for helping with fieldwork and providing additional video. Join Ben this month as he showcases one of the most exciting finds for Orianne’s field crew yet this summer, a Rainbow Snake (Farancia erytrogramma), Sometimes referred to as “eel moccasins”, these secretive snakes are true gems of the Coastal Plain’s river systems. Tracking spotted turtles with Ben Stegenga in the South Georgia swamps. In this month’s Fieldnotes, Ben ventures into the Ocmulgee River floodplain to look at the Marbled Salamander, a beautiful denizen of Georgia’s hardwood lowlands.